I have been remiss: I’ve neglected to introduce you to one of the books I acquired this Christmas: A Concise Encyclopedia of Gastronomy (originally published 1952) by famous English wine merchant Andre L. Simon. Apologies for the omission; I hope a slice of blackberry cake will set things right. Simon’s tome (800 pages of tiny print) is organized into broad categories like “Fish” and “Fruit”; from there, he goes into an exhaustive alphabetical listing of species of fauna, flora, sauces, and cocktails, with a few preparation methods and recipes for each of these ingredients. I found some blackberries on sale at the grocery store, so I looked them up and found them amidst Black Bearberries, Black Currants, Black Guava. Simon evidently took many of his recipes from other authors; the cake recipe upon which I settled has Gladys T. Lang’s The Complete Menu Book (1939) listed as a source. Gladys definitely knew her business. This “pudding” (more a dense cake) is easy, moist, and not too sweet. I’m sure it would also be lovely with other types of berries – or even mixed berries, if you really want to get crazy. It starts very simply: toss some berries with sugar and set them aside. To prep, you also need to butter and flour a cake pan. 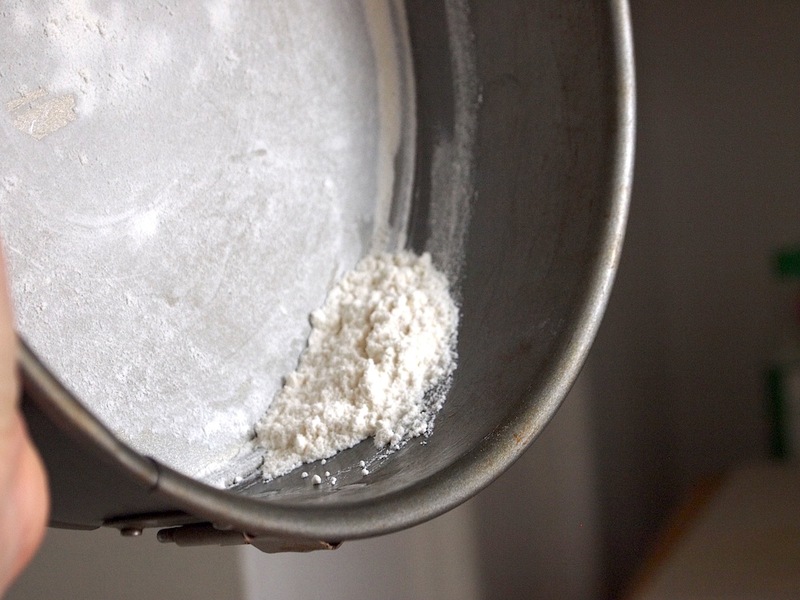 I always flour my pans by tossing a couple tablespoons of flour in the bottom, shaking it around to flour the bottom surface, then tilting the pan and rotating it to get flour on the sides. This cake calls for very little butter and sugar, so I recommend creaming them by hand: the paste formed would just stick flat to the bottom of a mixer bowl. 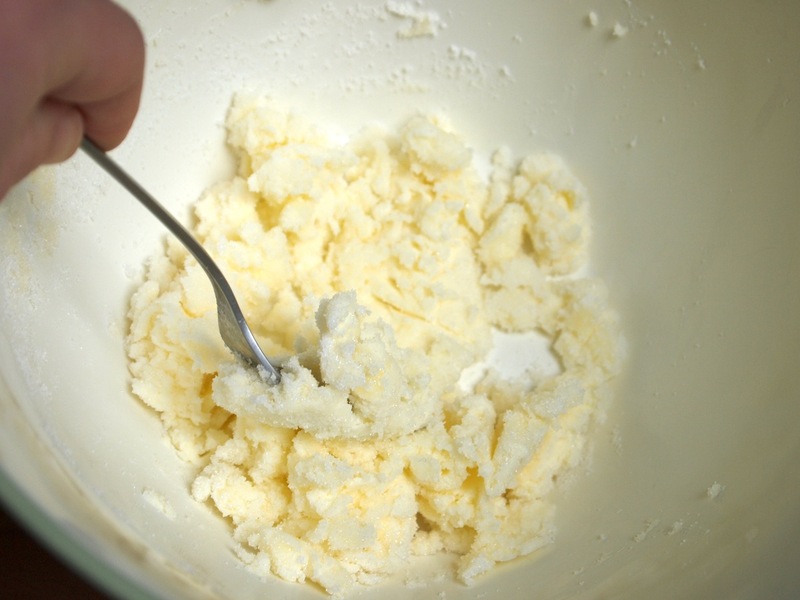 Make sure your butter is nice and soft, and use a fork to blend it with the sugar. The batter is very plain: once the butter and sugar are creamed, eggs are mixed in, then flour (with baking powder), and milk. Half the batter is spread into the bottom of the pan (it’s pretty thick, and needs to be pushed around). Then the sugared berries are placed on top, in a single layer, and the remaining batter is spread on top. The cake bakes for half an hour. The top will probably appear kind of under-done at this point, but I promise it’s nice and brown on the bottom. When it’s done, you skate a pat of butter across the top; the heat from the cake melts the butter. Sprinkle brown sugar over the butter. Brulee the sugar in your broiler, and the cake will be gorgeous, brown, piping hot, and ready for eating. It’s great with whipped cream or brandy sauce. 1. Preheat the oven to 350 degrees. Butter and flour a 9-inch cake pan. 2. Cream together butter and 3 tablespoons sugar. In a medium bowl, toss the berries and the remaining sugar. Add the eggs to the creamed butter and mix thoroughly. 3. Sifted flour the flour with the baking powder and salt, add half of this mixture to the butter and eggs, and blend. 5. Add the milk to the batter gradually, mixing constantly. 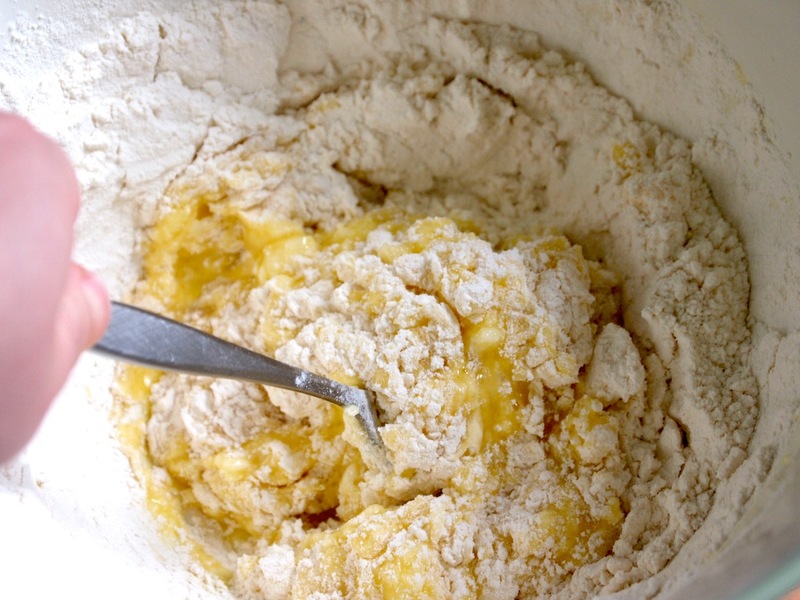 When it is completely incorporated, mix in the rest of the flour. 5. Spread half the batter across the prepared pan. 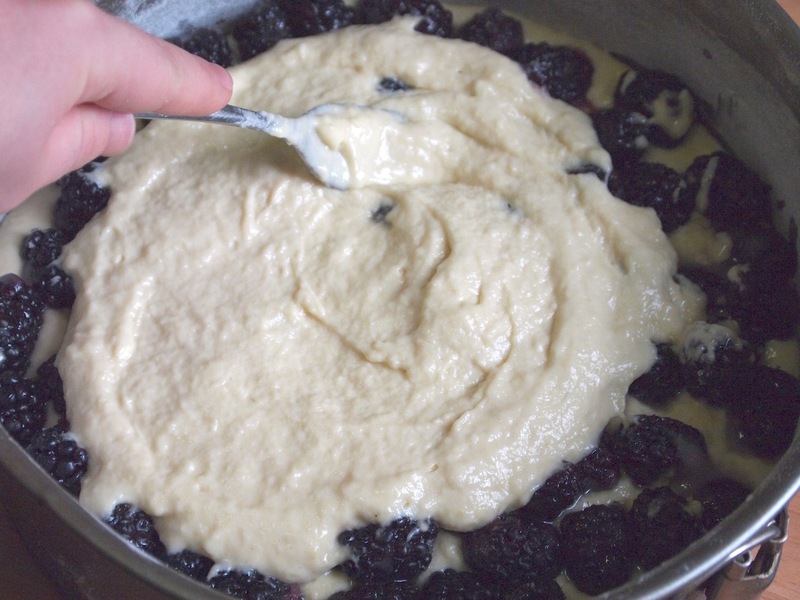 Place the berries in a single layer on top, then spread the remaining batter over them. Bake for 30 minutes. 6. Immediately upon removing the cake from the oven, rub a pat of unsalted butter across the top. Sprinkle the brown sugar evenly over the top. Use a torch to melt and caramelize the sugar, or place the cake under the broiler for a minute to do so. Serve hot and enjoy! what a great dessert!! These pictures are making me so hungry!! oh. my. gosh. that looks amazing! I like you use plenty of blackberries. 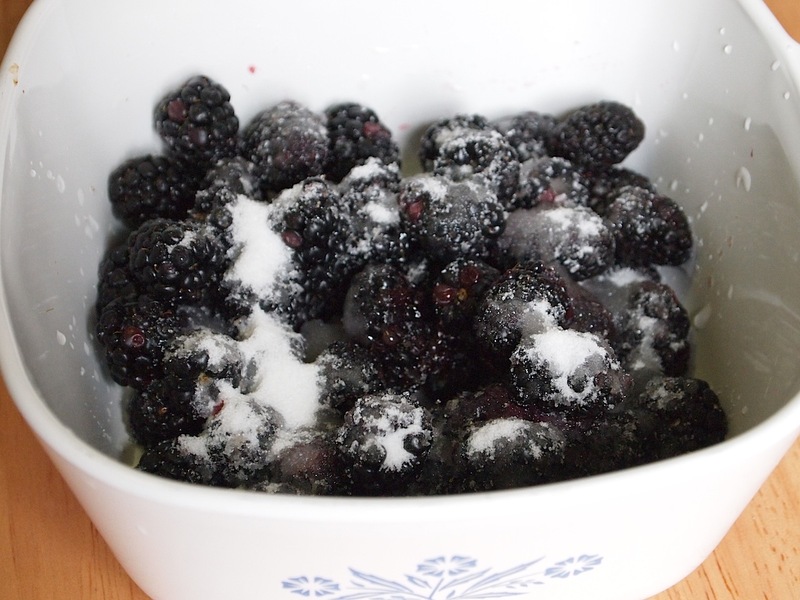 My kids love blackberries so much and they will love this (and looks easy for me to try – your instructions are great!)! Thanks for posting this! I love blackberries and this looks delicious! This looks perfect for a brunch. Yum! I’m glad I need to go to the grocery soon so I can get some blackberries to make this! It sounds absolutely perfect for this warm weather now! oooh my – just when i thought i would step away from sweets for a bit – you’re luring me back with this decadent pudding cake… i really want some right now! Oh, my gosh! I just love berry desserts and this looks incredible!!! Oh goodness that up there looks so good! 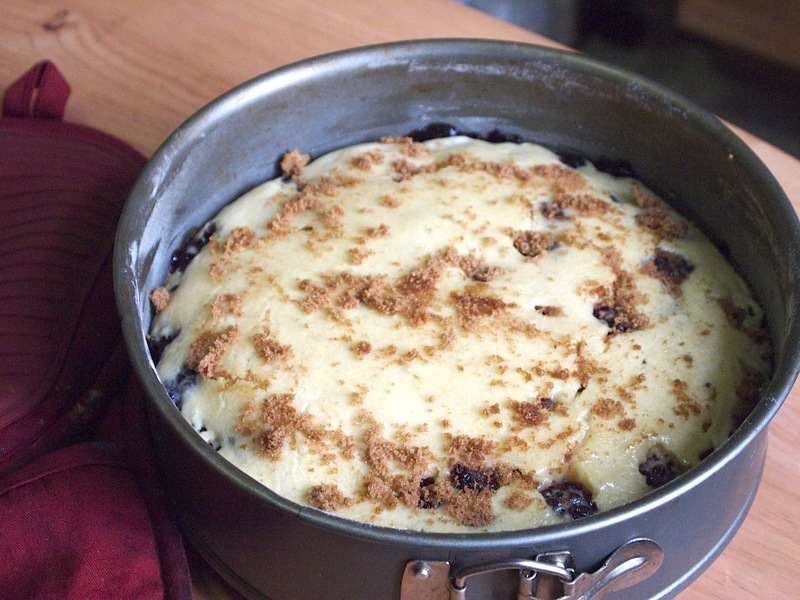 I love blackberries and I think I really really love this dessert… it sounds amazing! Gorgeous cake! This is the kind of pudding I grew up with, my grandma made it all the time! I love the looks of the texture of this! Pudding is a favorite of mine and I’ll take it wherever I can get it! Plus it has a brulee on top. What could be better? This looks fabulous! That first picture is simply mouth-watering! I get a desire for blackberries every time I see this. lol! Mmm…. this looks so good. I just ate a HUGE dinner. I could totally go for some of this right now! Hi Celia! This pudding looks amazingly yummy. I wish I could find good blackberries now (they’re not in season in Italy… 🙁 ).